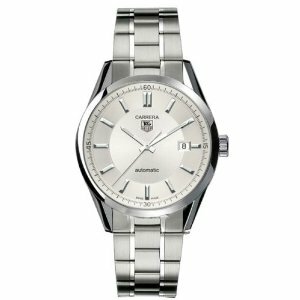 The TAG Heuer Carrera WV211A.BA0787 is a watch that is sleek and professional for both business and pleasure. It has a simple, classic silver-toned dial, a stainless steel bezel, and a triple link stainless steel bracelet. The bracelet features a fold-over clasp with double push-button safety, to ensure it stays securely on your wrist. The scratch resistant sapphire crystal window protects a watch face that is simplistically adorned with silver toned baton hour and minute hands, and silver hour markers, all of which are luminous. A second index is included along the interior of the bezel, and a date window is located at 3 o’clock. This watch is also features Swiss made automatic movement, meaning this watch doesn’t run on a battery, but rather the movements of your arm as you go about your day. However, you also don’t have to worry about the watch stopping if you take it off for a brief period. This timepiece has a 38-42 hour reserve. The back of the case features an exhibition window that shows off the automatic movement at work. mind before you buy. The first is that while the watch band can be adjusted by adding or removing links from the bracelet, there are no micro-adjustments, such that the band is incredibly sturdy, but it may be difficult to find a fit you’re 100% happy with. 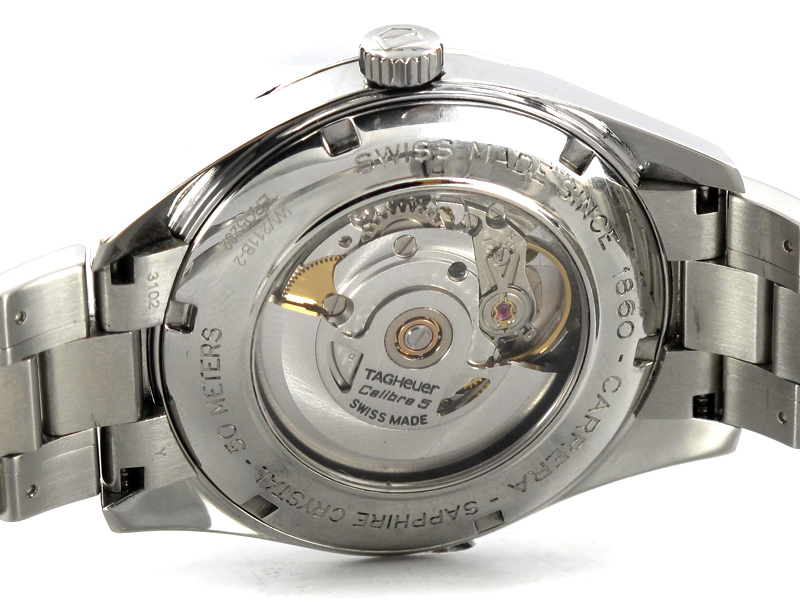 Additionally, the mirror finish on the stainless steel bezel and parts of the bracelet are not completely resistant to scratches, so you may have to be mindful to treat this watch well. Additionally, while the watch is water resistant to 165 feet, it’s debatable as to weather or not it’s safe to wear it while swimming. As such, I would use that 165 feet as a safety net—if you get pushed in a pool while wearing this watch, it’s nice to know it probably won’t get damaged, but I wouldn’t recommend going out of your way to purposefully submerge it. If you’re on the market for a different look, there are plenty of automatic watches in the TAG Heuer Carrera collection, this exact watch can be found with a black dial, but there are a plethora bracelet materials, dial colors, and bezel details to be fawned through and pondered. I have recently bought this watch returned to Tanzania, dived in the pool and the watch is now full of condensation, so much for being water resistant to 50m???? I’m extremely disappointed.